One of our Bus Bay access control officer working at BB-21…is Tobias Almel Esguerra and he is employed by A.S.P. Inc. security company. We would like to express our special thanks to him for the wonderful job he does in helping our passengers transferring from international flights to domestic ones. It is a joy for us to work with such a dedicated non-GTAA employee. He is an excellent example of how a job should be done. 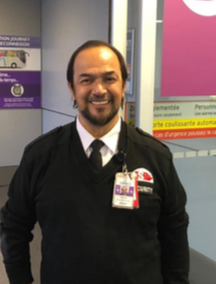 We sincerely hope that all his colleagues will reach his level of accountability and the passion he shows toward our passengers.